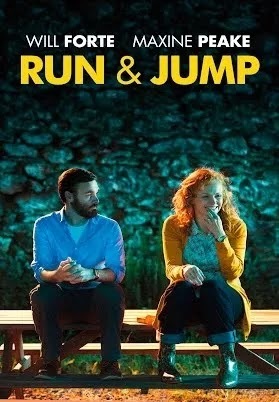 Will Forte steps away from his comedic comfort zone to play Dr. Ted Fielding, a quiet American doctor spending two months in Ireland with a family whose father, Conor (Edward MacLiam), has had a stroke that's left him a shell of his former self. Ted is merely there to observe and report, not for any sort of treatment. He observes with a camera that, at first, makes Conor's wife Venetia (Maxine Peake) angry and desperate for space. However, their close proximity eventually allows them to grow accustom to each other. It's an eccentric family, and their peculiarities allow for both dramatic tension and awkward comedic moments. Most of which involve shy, reserved Ted interacting with the family's young, adorable daughter Noni (Ciara Gallagher), whose curiosity takes precedence over any sort of boundaries. The drama, on the other hand comes in several forms, the first of which is Conor's struggle with motor control and forming words and sentences. Venetia struggles to cope with his ever more peculiar, obsessive tendencies. And their gay son Lenny (Brendan Morris) struggles with bullies at school only to come home to hear Conor spout gay slurs, and refer to his as "Penny." This all sounds dramatic and depressing, yet Green manages to infuse life into the proceedings, keeping a fairly upbeat tone for much of the film. Supplying that life is Venetia, whose youthful spirit and positive outlook is tested but never broken. While Forte is likely the only recognizable face in the cast, Maxine Peake steals the show, if it weren't hers to begin with. While Conor is a broken man incapable of returning to the man they knew, Venetia resonates with enough life for both of them. Her infectious energy even brings life to Ted, pulling him out of his closed off shell. During the day she plays the part of responsible mother and caretaker of an increasingly standoffish Conor, but in the evenings when everyone else is sleeping Venetia and Ted bond over rainy bike rides, and midnight snacks. The obvious trouble we face, is how to react to the triangle forming at the center of this tale. Green is keenly aware of the moral quandary, and thankfully treads carefully. Where a lesser storyteller may have ignored the dilemma in favor of making the film a romance, Green brings it to the forefront. We can't blame the parties involved, we understand Conor's diagnosis, and Ted fills a necessary void in Venetia's life. She's certainly an alluring personality, yet it isn't just Ted's relationship to Venetia that's called into question. The family as a whole comes to rely on him in the absence of a capable father figure. Forte proved he could play a dramatic role in Alexander Payne's Oscar nominated 2013 film "Nebraska." Here he continues that effort making a strong case that he should be given more dramatic roles. It's a subtle performance that exudes a sense of longing, despite his shy nature. Yet Green gets strong performances from all her actors, and, as a bonus, puts together a great soundtrack. Her musical choices feel as essential to the story as any other element at play. As "Not Enough" by Get Well Soon plays over the credits, the words seem written to accompany this film. "I don't know why for me it's hard to choose, but it's the truth that I'm in love with you. But sometimes love alone is not enough, and I'm just stuck here in the middle of." She's directed a few short films, but this is her feature film debut, and it's a good one.